I once attended a lecture by Jim Sherraden, the manager of the historic Nashville letterpress shop, Hatch Show Print. They are one of the oldest and well respected poster shops in the country. 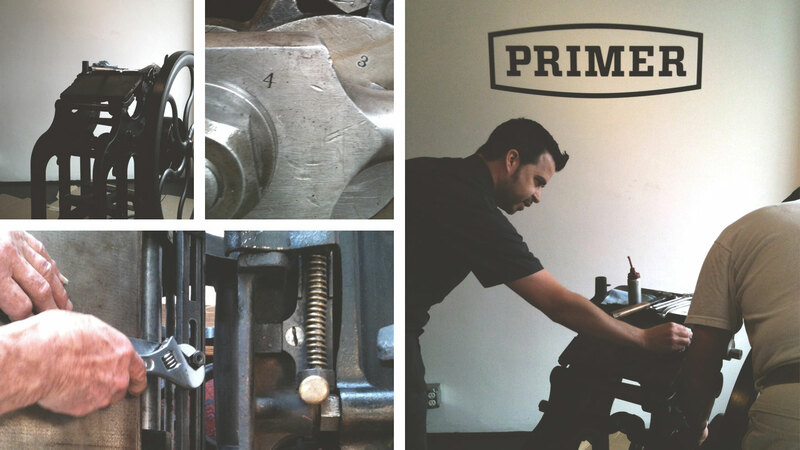 All of their work is still printed by hand on carefully maintained antique printing presses. If you haven’t heard of them, look them up here. One of the subjects Jim talked about was, preservation through production. That concept really stuck with me. The best way to conserve these historic printing practices was to actually do them, not to restore old printing presses and put them in museums. Their dedication to a bygone craft was inspiring. Several years ago, I met a retired gentleman at a barn sale who had decided to sell his old print shop. It included a GEO. P. Gordon antique platen press from the late 1870s, five cases of type with over eighty typefaces and all of the tools and trimmings. It was a great opportunity to learn something new. After giving it some serious thought and getting guidance from friend of the studio, letterpress printer Scott McClelland, from Paper Meets Press, we decided to go for it. With a lot of help and a really long day of heavy lifting we managed to disassemble and remove everything and bring it out into the light. The press was old even by letterpress standards. A rare press that predates the most common presses of the late 19th century. It had over one hundred and forty years of dirt, oil and ink on it. It had to be carefully cleaned before we could put it all back together. As a side project for the studio, over the course of six months, we would grab a part and go behind the studio to painstakingly clean each part with kerosene. It was an incredibly labor intensive dirty job. There were also two cast iron brackets that needed to be repaired. It wasn’t easy finding someone with the knowledge and skill to fix cast iron over a hundred years old. It took ages to find the right craftsman to do it right. 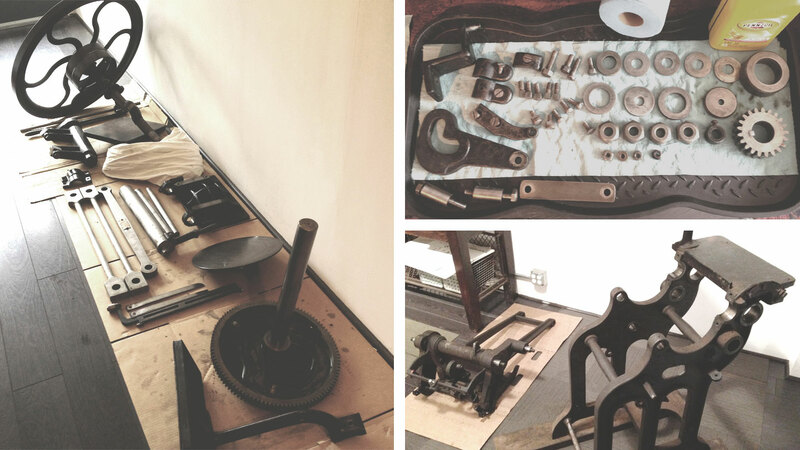 Eventually, with the help of the original owner, we were able to put the press back together. Oiled and spinning it is a real sight to behold, a true labor of love. 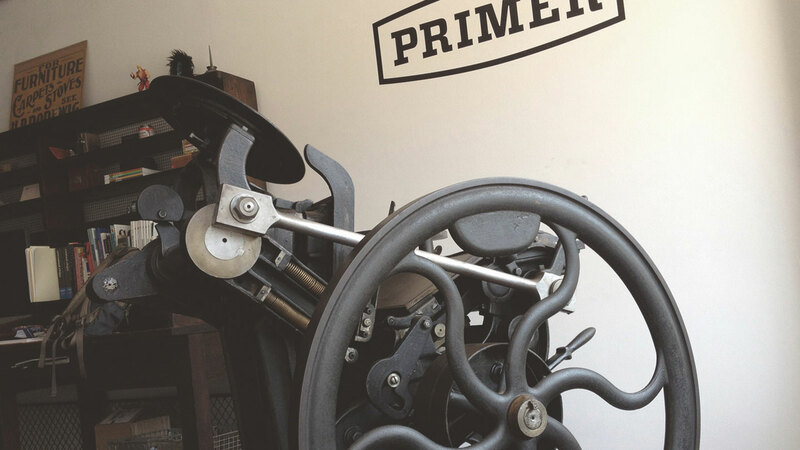 The restored press proudly sits in the front window of our street level studio. It gets a ton of attention by folks sitting in their cars waiting for the light to turn green. We often catch people straining to figure out what it is. We run it as often as we can and it has brought a lot of joy, pride and energy to the studio. It has become a constant reminder that we need to approach all of our work with the same careful attention to detail that goes into letterpress printing from the 19th century. If you have any questions about letterpress printing our would like to see a demonstration please don’t hesitate to get in touch. We are extremely grateful for the help and support we have received in making this dream come true. We would like to thank photographer Russ Underwood for all his support and help moving thousands of pounds of cast iron and lead type and to Scott McClelland for his knowledge and advice.